In my wealth management business, I have the heart breaking job of telling 60, 65 and 70 year olds that although they are or just about to retire, they can’t afford it. Usually, they can only afford a quarter of the income they are drawing. Can you live off a quarter of your income? Their answer always is, there’s no way. I’ll just have to die soon. I can’t live like that. So that’s why I’m passionate about everyone having a second stream of income. Something they really enjoy doing. Something that gives you energy when you do it – the energy that comes from knowing you’re just meant to do this. The passion from creating. The curve. It’s all about the curve. You know, the one that looks flat in the beginning, then slowly starts to creep, then rises exponentially. That’s the one. Because building a second stream of income is exactly like that. No matter how hard you work. The results in the beginning are always gradual. Very gradual. Painfully slow. But the growth does come. Which is why you need to start NOW! That gives you choices. Choices to stay, choices to work half day. Choices to take an extra special holiday. But you need to have a long term view on the project. I started two companies last year – my wealth management business, and Working Women’s Wealth. Whilst both are in that painfully slow portion of the gradual growth curve despite working 6 days and nights a week, my long term second income business is Working Women’s Wealth. How’s it going to help my retirement? Well, in La-La Land, where dreams come true, my goal is that it helps me become a paid speaker at conferences both locally and internationally. As I build my audience, my body of work, my podcast and my skills, my hope is that I can then get paid to speak globally. Academic tourist is what they call it. Being paid to travel and see the world – now that’s my idea of a great retirement. I’ve promised John that within 8 years’ time I would have my first international speaking assignment where we get paid to fly business class and see some wonderful foreign city. So far, I’ve invested a HUGE amount of time and money into Working Women’s Wealth. I don’t mind as I am passionate about teaching women about money. And I generated my first speaking fee in November. Just 1 month after starting it. It was tiny – but it was there. But I am committed to the vision of having that second income stream available to me when I retire and no longer want the stress of managing the money of hundreds of clients. That strong long term vision is the first step to long term wealth. And I know it takes time. And hard work. Which is why I’m starting more than 20 years before I plan to retire to build it. In this modern world, there are so many things you can do. 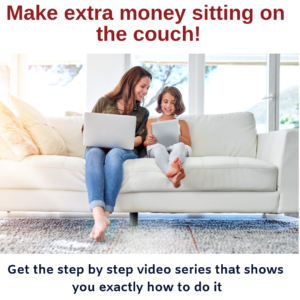 In my article 6 Ways to make money sitting on the couch, I highlighted just some of them. But that’s just a start. It really comes down to the fact that a freelance workforce is the way of the future. And so whatever you want to do can be done from your home. I have friends who are sculptors, artists, copywriters and accountants who are all using the power of online marketplaces and skills websites to earn a second income. So at the end of the day, it comes down to only one thing. Yes. That’s all. How badly do you want it. 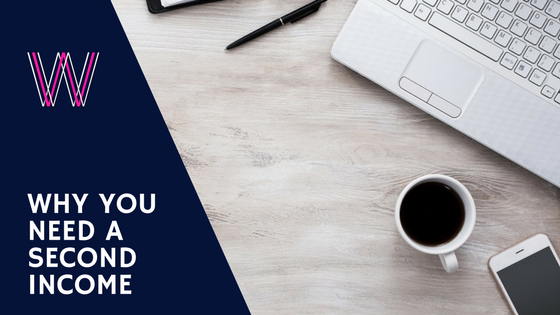 I can’t tell you how many times I send people who are struggling financially the link to the 6 ways article, or share websites in their existing field that can help them make more money. The response? I’m too tired when I come home. I can’t wake up early. I don’t have the time. It’s beneath me. You don’t know what it’s like. My kids are too demanding. I’ve heard every reason why not. Before these last 18 months, I used them all myself. And not in a million years did I ever see myself as an entrepreneur. And my response (in my head) is that you obviously don’t want it badly enough. Hard to hear, but true. It’s Saturday as I write. And my girls are on mid-term break. And I’d love to be chilling with a Gin and Tonic. But I work every Saturday – and so I am working whilst I hear them giggling in the pool. It’s been 3 years with very little social life – what time I have free, I spend with John and the girls. Every Sunday I’m 100% theirs. But I have a dream so big, I want it so badly, I do. And it helps that my savings are rapidly disappearing so I desperately need to make some cash. Each month producing Working Women’s Wealth costs me money. So I need at least one speaking job a month to make it break even, and earn back the costs of editing the podcast, and the costs sunk into the podcasting equipment. So ask yourself honestly, how badly do you want it? How badly do you want to avoid living off a quarter of your expenses when you retire? How badly do you want to go on that holiday? 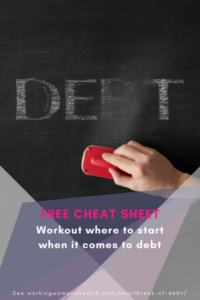 How badly do you want to get out of debt? Badly enough to switch off the TV?